Where it all happened: die Neue Kirke (New Church) in Armstadt, now known as Die Bachkirke. “Johann Sebastian Bach was known for his terrible temper. In 1705, on one of his first jobs, he got into a street fight with a musician of lesser talents and they both ended up in court.” In this anecdote, New York composer Jonathan Breit found the inspiration for Der Zippelfagottist, a mini-opera commissioned by The Cecilia Chorus of New York for its December program A Bach Family Christmas. Sandwiched as a comic intermezzo between the stirring cantatas Wachet auf, ruft uns die Stimme by Bach’s son Johann Christoph Friedrich and Meine Seele erhebet der Herren by Bach’s cousin Johann Ernst and the regal Magnificat by Johann Sebastian himself, Der Zippelfagottist takes for its libretto excerpts from the original court documents of the altercation outside the Neue Kirke. 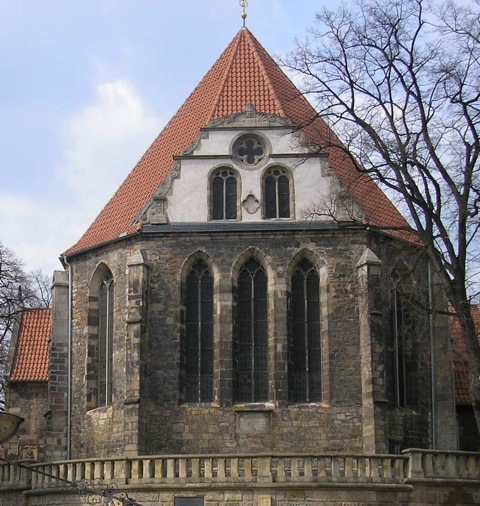 It includes testimony by Bach’s cousin Barbara Katerina Bachin, for which Bach had to request special permission as women were not considered reliable witnesses. The parts of Bach, Geyersbach and the Church Court Official will be sung by the soloists for A Bach Family Christmas and the Chorus will represent the Townspeople, reacting to the goings-on and offering a little moral advice at the end. Breit, who in addition to composing also works as a pianist, a vocal coach and - like Bach - a church organist, has always written in a humorous vein. He studied music and linguistics at Yale and received a Masters of Music degree at the Mannes School of Music (“There’s no school of funny, or I would have gone there.”) and says he feels equally at home in the musical theater and the opera. Among his compositions are the short pieces Recette de Bouillabaisse and Ocho Kandelikas and the 45-minute musical The End of Men, based on Aristophanes’s Lysistrata, all premiered with Cantori New York. He is currently working on a humorous song cycle called Overheard Conversations, based on eavesdropped exchanges in a park, a furniture store, a subway and the lobby of a hospital.